The unbreakable, heavy-duty earbuds for all occasions. What are Your Favorite Durable Earbuds/Headphones? Jump to: Durable Earbud Reviews | What Makes Headphones Durable? Feed up with constantly having to buy new earbuds, because the old ones keep breaking? 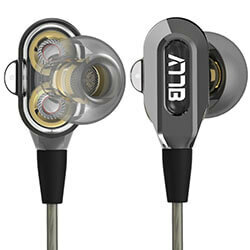 The 7 top “invincible” in-ear monitors/earbuds that will last you longer. All of the earbuds below are made out of quality materials, like durable plastics and aluminum, don’t have any major weak points and are simply better suited for the “hard human abuse”. No matter how much money you want to spend on new IEMs, if you get any from the table above, they’ll have top-notch durability. Related: Find the most comfortable earbuds here. Quality materials: Strong, durable plastic is lightweight and offers great protection from physical damage. Even better is metal casing, like aluminum which offers even more advantages. The thickness of rubber around the wires is also very important, not all rubber is made the same. No weak points: A lot of headphones have some kind of weak points, whether it’s badly made I connector or weird, crack-able shape of main earbud design. These weak points are always revealed after the first few weeks of use so it’s impossible to know them beforehand. Design of hinges: If any hinges are present, it is imperative they’re made for long-term use and don’t crumble after a few weeks. Cable coating: Some cables are reinforced with Kevlar and some have extra layers of rubber, but since cables are one of the usual weak points, cable strength plays an important role. Moisture resistance: For athletes and fitness freaks sweat-proof headphones are a must. For everyday use, you’d like the headphones to withstand a bit of rain that will surely come in its way eventually. Click here to find out top headphones for the gym. Good warranty helps: Customer support play a big role in deciding to buy certain headphones. If you know that you have access to good customer support that can quickly replace your broken earbuds, then it’s much easier to make the purchase. Especially if the product has a lifetime warranty like Koss’s. The well-known Shure SE215 earbuds are a powerhouse in terms of what you get for the money. …but also superior noise isolation and Hi-Fi sound quality. Super durable, sweat-proof, suitable for sports or stage use. These will last longer than any other earbuds simply because they are designed to do so. Their plastic, but robust casing is made to withstand the heavy stage use and additionally providing complete sweat protection as sweating on stage is something normal. The memory wires are detachable so you can easily replace them if they get damaged, just keep in mind Shure replacement parts are quite pricey if you buy them from their original site. Detachable wires are a great option, usually not available with other earbuds, not to mention this simple feature will save your wires from entanglement and tearing. Shure SE215 have an L shaped plug-in which is another plus for durability. They are superbly built and even with improper use (sitting on them, tugging, dropping them in water…), you should get at least a few years out of them. Because of the memory wires, keeping them in ears is easy even doing sports, you just have to get used to putting them in and getting proper fit. This might take some time, but eventually you’ll figure it out. In the beginning you might have some concerns regarding comfort as they do feel awkward the first time you put them in. This problem should go away once you play with it a little and get used to the specific Shure design. In the end, these in-ear headphones are as comfortable as any other IEMs. They don’t have any microphone for taking calls, but have amazing noise isolation, up to 37 dB, that is one of the best of all in-ear headphones on the market right now. Check other noise isolating headphones here. The sound quality is amazing at this price range. You get a rather flat sound with no ranges lacking or being too emphasized. Except the real audiophiles will hear a slight emphasis on bass, but this isn’t bad at all. The bass makes music more fun to listen to, without being too fatiguing. Note, these aren’t suited for bassheads, but for people with normal tastes in music, without any preferences in sound ranges. Vocals are also very clean and crisp making the sound perfect for all types of music, from pop, rock to classical. Sound quality can compare to earbuds 2x times the price and Shure SE215 are a great entry audiophile model. 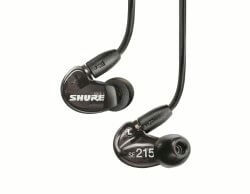 Overall, if you want in-ear headphones with great sound isolation, comfort, top-notch durability and superb sound quality with nice bass, you should definitely pick Shure SE215. 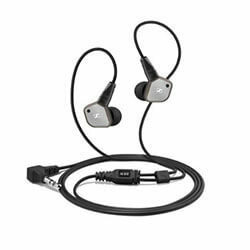 Sennheiser IE80 in-ear monitors are one of the best models Sennheiser has to offer. The impeccable built quality, good ergonomics, and audiophile sound quality make these a great choice for even the most demanding users. Built quality is top notch, even better than with IE8 which is an older version. The housing is made out of brushed metal and quality plastic which gives them that premium look. The cables are detachable with thick rubber strain relief. The rubber is more flexible and higher quality than with your average IEMs. The cool thing about detachable cables is when they break, which happens often with IEMs, you can simply replace them and you have perfectly functioning in-ear monitors again. The 3.5mm plug-in is L shaped which gives it some additional resistance to stress. Additionally, you get a 2-year warranty, if they die out you simply get them replaced by a new model. These IEMs can compare to the best when it comes to build quality, use them with confidence. Even though the housing is quite large and people with small ears will have to be satisfied with a rather shallow fit, the ergonomics and comfort of wearing Sennheiser IE80 is very good. These are meant to be worn over-the-ear but can be worn the regular, under-the-ear as well. The fit is very stable so you can use them for sports and working out easily. The only thing you can’t do is wear them comfortably when lying down from the side on a pillow. The housing is just a bit too big. For most people, the ergonomics are perfect and you’ll soon forget you’re wearing them. Also interested in top Bluetooth noise cancelling headphones? The special feature of the Sennheiser IE80 is their bass tuning function. By turning small screw on the side of each ear bud you can tune the sound to your liking. We didn’t really see much use for it since you can equalize your music more easily with a software, but it works and it’s probably useful for those who use music devices without an equalizer. You also get a nice selection of ear tips. Altogether 10 pairs of ear tips will spoil you for choice. 8 of those are silicone tips with single and double flange design in 3 sizes, plus 2 pairs with a slightly different double-flange design. The foam ear tips only come in 2 sizes as well but offer great comfort and noise isolation. Other accessories included are the shirt clip, flexible ear hooks for sports use and a classic Sennheiser plastic case for carrying your IEMs and ear tips with you. Sound quality will make even audiophiles happy with a balanced soundstage producing detailed and rich sound in all ranges. There is almost no sibilance and the highs remain crisply clear even with high pitch music. The bass isn’t basshead level, but it’s more than enough to give any music genre a dynamic and powerful feel. The mids don’t disappoint either with rich details and clarity fulfilling the role of mediating between the highs and lows with a gentleness. One of the better features of IE80 is their big soundstage. It’s comparatively bigger than with most IEMs at this price point and can even compare to IEMs double the price. You’ll hear the instrument separation and where the sounds are coming from much better than with alternatives. Microphonics is almost nonexistent, you’d have to move around with cables flapping very hard to hear any distortion in the sound. Noise isolation is good, but as with all IEMs, depends on the ear tips you’re using. Double flange works best with foam ones second. Value for money in sound is very high here because you’d have to spend a couple hundred more to get comparable soundstage and clarity from some other model. Overall the sound signature is balanced and makes for an amazing music experience anywhere you go. 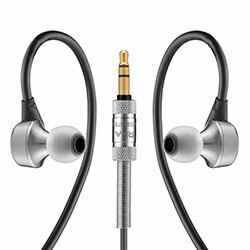 For audiophile-grade in-ear monitors with top notch build quality and good comfort pick Sennheiser IE80. RHA MA750 are one of the most popular in-ear monitors on the market right now and for a good reason. For the price of slightly over $100, you get IEMs that can compare to models 5 times the price in every regard. Keep in mind there are 2 models available, the MA750 is the regular model and the MA750i has an in-line microphone and remote for making calls and controlling music. It also costs a bit more. When it comes to durability RHA MA750 is a top-notch product. The housing is made out of aluminium which doesn’t rust when in contact with water. In fact, all the hardware is made out of metal which is a very nice touch and makes these earbuds look like they’re a few years ahead of time. The tangle-free cables are long and thick with rubber coating. The 3.5mm plug-in is I shape and has a long strain relief. The cables aren’t detachable like with Shure SE215, but have strong stress relief on all sides. In any case, if the earbuds somehow fail, you get a 3-year warranty and can get your earbuds replaced by new ones. Most earbuds don’t have such a long warranty. Overall, these are one of the best-built earbuds on the market right now, plus they sound good. While the metal housing makes them a bit heavier it doesn’t majorly affect comfort. Actually, they’re quite comfortable. The design is small and ergonomic enough to fit well without rubbing you the wrong way. Very soon you forget that you’re wearing metal earbuds at all. Keep in mind these require the over-the-ear fit due to their design, don’t try to wear them any other way. What are the top Bluetooth headphones? Inside the package, you get quite a few accessories. You get 9 different pairs of ear tips, 6 single-flange and 2 double-flange silicone tips, but also 2 pairs of foam ear tips. This gives you a lot of choice and you’re sure to find a proper fit for yourself. Additionally, you get a shirt clip and a nice leather carrying case with a zipper to pack your earbuds in. The MA750i version has an in-line remote with a microphone. Compatible with iPhone and Android phones works as you’d expected. The microphone is good enough for making calls on the go, just don’t expect studio quality sound. Sound quality is another major strength. Their sound signature is slightly on the bassy side, but not overly so. They’re not basshead IEMs, but rather “balanced” with lively, deep bass that goes very deep. They’re better at sub-bass and less at mid-bass. 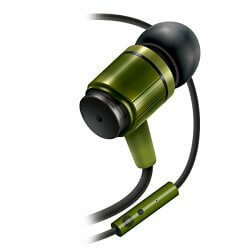 The middle range is detailed and full-bodied which is great for the type of earbuds these are. The highs don’t disappoint either with their clarity and precision even though the high ranges are slightly recessed. Sibilance doesn’t seem to be a major problem with most songs, especially if you equalize, though sometimes does suffer from harshness. Generally, the signature is slightly warm, but not too much. There are very easy and enjoyable to listen to. Soundstage and instrument separation are better than with similarly priced alternatives. You can clearly hear and imagine the space the sound is coming from. Noise isolation is also very good, especially with foam ear tips that you get in the package, those tend to provide the best passive noise isolation. Microphonics is only a small problem, as long as you’re not running with them the cables stay put and don’t distort the sound. In the end, you’ll have a hard time finding a better value for money IEMs that are built as well and sound the same as MA750/MA750i. If you’re looking for tank-like built earbuds with good comfort and rather balanced sound quality that can compare to models that cost $400+, then pick RHA MA750. Tweedz are another well-built wired earbuds that are best for listening to audiobooks and podcasts. The nylon braided cable with substantial weak point reinforcement makes these earbuds one of the best in durability right now. While strong in build quality they lack a bit in sound quality. With a very bright sound signature they are most suitable for audiobooks and classical music (and other non-bassy genres). Check best bass IEMs here. In a barebones package, you get 3 pairs of silicone eartips and an in-line microphone and remote control in the newer model. Tweedz can be a good second pair of earbuds for audiobooks and podcasts that will last you a long time. Click here for Tweedz full review. For the best bang for your buck, Brainwavz M2 deliver more than the alternatives. For the price of well under $100, you’re getting a pair of in-ear monitors that are built to last and also sound great. This is a value for money model that won’t disappoint you. Aluminium housing is light yet tough. The strain relief is prominent and does the job well. The cables are quite thick but still flexible enough not to be annoying. The 3.5mm plugin is L shaped and protected by thick plastics. They aren’t sweat or water proof, but a bit of rain and sweat don’t hurt them. Build quality is solid and you can expect these IEMs to serve you well for a long time. In any case, if your earbuds die or break in the first year, you get them replaced because of a 1 year warranty by the manufacturer. Comfort is good enough for long listening without discomfort as long as you find the right fit for your ears. In the beginning, you need to find the right fit because the cables are quite sturdy and may make the fit unstable. The earbuds are light and small enough to fit in most ears just don’t try to sleep with on the side since they bulge out a bit too much. They aren’t the most heavenly comfortable earbuds ever made but still do better than average. In the package you get regular silicone, single-flange ear tips of 3 different sizes, plus one pair of premium Comply foam tips for better sound isolation. Additionally, you get a shirt clip and a nice hard, clam carrying case to put everything in. The Brainwavz M2 don’t have any microphone or in-line remote. The only small problem is the left and right earbud markings which are a bit harder to see, especially in a darker environment. The most surprising thing about Brainwavz M2 is their sound quality which can easily compare to IEMs in $100 price bracket. The sound signature is slightly bassy, but not too much to overpower all other ranges. They aren’t exactly a basshead model, but still create a fun, dynamic sound that caters to the popular bass emphasized music of today. The mids are very clear and rich which is impressive for this price. The highs are good too, not too extended or harsh, but enough to compliment other ranges. Sibilance is therefore nonexistent on most tracks. Soundstage is about average which is one area where the M2s can’t compare to higher-end earbuds. Microphonics isn’t a major problem, it is present with fast movement, but with using a shirt clip you can get rid of it completely. Sound isolation is about average for in-ear monitors which means it’s pretty good, just don’t expect top-notch attenuation like you’d do from a higher end model. Overall, the sound is a very nice surprise for such an affordable price and offers plenty of fun for an audiophile or a more casual user. To maximize your money, Brainwavz M2 offer the best combination of durability, comfort and sound quality for an affordable price. For the most robust build quality for little money, check out the AudiOHM RNF. In fact, they are so durable it’s impacting the user experience. For around $20 you’re getting premium build quality, like aluminum casing and 3mm thick cables which are the thicker we’ve seen so far. The cables are supposedly so strong they can hold 10lbs of weight, but don’t try that with yours. With L shaped plug and Y splitter, both additionally protected by silicone and coming together with a protective bag, these earbuds are built for an apocalypse. These have “ultra-durable” in their name and that’s quite right. In case you do break them, there is a limited lifetime warranty by Gogroove which guarantees the earbuds long life, or you get a replacement model. There is a slight problem having extra durable earbuds. The reason being, they’re heavy. When you wear them in your ears, you’re going to feel the weight pulling down. Even the wires have their own weight and you’ll have a hard time forgetting you’re wearing them. Then again, if you don’t mind wearing heavier earbuds, knowing they are made for heavy abuse, then these are a good choice. In case you want to use them for running, pick some other models as these will likely fall out. Check great running headphones here. There are only 2 color choices, either army green or the model called “Rasta” which is a combination of red ear tips, yellow rings and green casings with black cables. This color combination really stands out. The on-cord microphone works nicely but isn’t anything special. The sound is probably where these in-ear headphones are most lacking. The sound is quite bass heavy, even boomy and overpowers mids and highs. Vocals are above average, just nothing special compared to more expensive earbuds. For the price, overall sound quality is very good, but don’t expect them to be better than most $50+ earbuds. If you’re looking for cheap, super-durability above everything else, than AudioOHM RNF are a great choice that are going to last for years. ActionPie VJJB-V1S are the best durable budget earbuds and solid everyday IEMs with great build quality. For the price of under $30 you really can’t expect much from any earbuds, but with this model you get a lot of value, they could be priced at $50 easily. Even though they are very cheap the build quality is very good. The housing is metal with beefy strain reliefs and flexible, rubber wires. The 3.5mm plug is I shape which isn’t the best but the strain relief seems big enough to avoid early wire damage. The earbuds aren’t sweat or water resistant. Overall, for the price, you’re paying and the earbuds you’re getting, build quality is very good. It’s not as good as with Shure SE215 of course and probably even AudiOHM RNF will last you longer, but the first cost a lot more money and the second don’t sound nearly as good. ActionPie VJJB-V1S are still built much better than regular earbuds, as long as you don’t abuse them too much they should last you for years. The dual-driver design doesn’t inspire confidence when it comes to comfort, but in fact, the fit is quite good. You can wear them under-ear or over-the-ear way because of the angled design. The housing is still small and light enough to fit most people’s ears and with a nice selection of ear tips, you are sure to find a comfortable fit. Some people even use them for sports without any issues. Do you play games? See what are the best wireless gaming headphones. In the package you get a very nice selection of ear tips, 6 different pairs, additionally you can carry them around in a clam carrying case or carrying pouch. You get 3 sizes of regular silicone tips and then a variation of silicone-foam tips though they’re not the same as the famous Comply type. The IEMs work with both, iPhone and Android phones, just plug in and play. The in-line remote/microphone has one button for accepting calls or playing/pausing music. The microphone works fine for making calls on the go, it’s not producing the clearest sound, but good enough for using it. 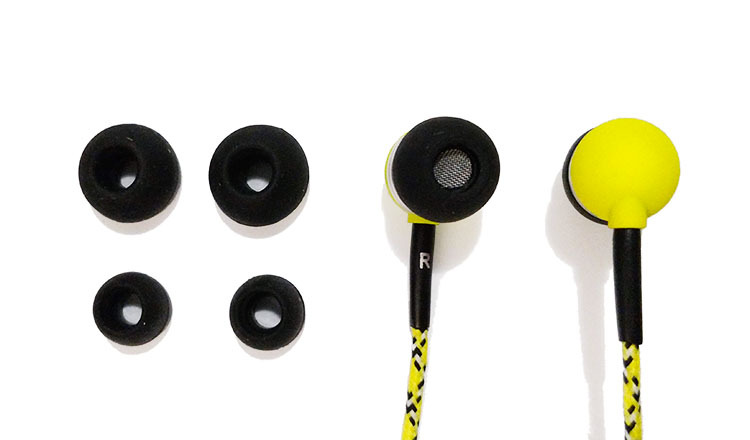 There are no marks for which ear bud is left or right fitting, so you have to figure it out by looking at the different design of each. The left ear bud has a small dot on strain relief. Sound quality is impressive for the price as well. The overall balanced sound signature can compare to earbuds many times the price. The bass isn’t heavy, but still produces a decent amount of lows to make popular music enjoyable. The mid and high ranges are well presented without distortion or sibilance. Generally, they don’t require equalizing as they naturally produce a balanced sound. As long as you’re not a basshead and want head moving lows, you’ll enjoy the sound of these. There is a bit of microphonics present, but it’s not too bothersome as long as you’re listening loudly enough and not moving. Sound isolation is average as well and mainly depends on the size of the ear tips you’re using. Soundstage is about average for budget earbuds, nothing special even though they have a dual-driver design. Overall, you can’t ask for more, ActionPie VJJB-V1S offers great sound quality and durability, comfort and everyday use features all for under $30. See top models of gaming headsets. Please share your opinion and tell us your story of other extra durable headphones out there. For future updates subscribe or like us on Facebook.